The Lord offers a rich and beautiful blessing in the reading from Isaiah today. It is one that is given with the condition that we hearken to his commandments. In my view what we receive from God, before we receive abundant blessing, is a challenge to live a penitential lifestyle. Furthermore, I believe that our living a lifestyle that reflects penance is not something that we need understand as negative in any way. Advent offers us a beautiful time of year to turn our hearts toward God. As we anticipate the joy of Christmas in our celebration of the birth of our salvation, the inner movement of our lives toward God is made possible. All of my life I have loved the Christmas season above all others. 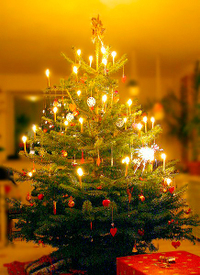 From my childhood into my adult years my fondest and clearest memories center around Christmastime. It was only natural, it seems, that upon my conversion to the Catholic faith that Chistmas would take on a new and deeper spiritual sense. Thus, each year since my conversion I have noticed the interesting phenomenon that during the Advent season my heart grows closer to God in prayer and longing for holy and spiritual things--the truest Christmas gifts. Also, we can see the truest meaning of penance--not self-inflicted punishment, but a natural and genuine turning of the heart within. Many ways exist for us to hearken to the commandments of God, and with the blessing pronounced by Isaiah in mind, it makes sense for us to think of those who may be without blessing at this time of year. In choosing to give of ourselves we show our obedience. In choosing to stand for those without we often find ourselves not fitting in with preconceived molds of spirituality. We may find ouselves being political outsiders. We could find our timidity being challenged or our boldness put in a more humble place. This is all penance too, and it comes with blessing to balance whatever affliction that comes, and for sure there will be moments to do without. It is clear to me that God does indeed bless my life as I offer myself to his little ones. Sure, there are difficulties--I couldn't begin to mention--and certainly there are risks involved in love, that is, in giving ourselves. Yet here is something to consider: perfect love casts out fear. So, go ahead risk giving, risk loving, risk offering something special, and above everything, be open to the kind of penance that is the inner turning of the heart toward God. It was difficult at first for me to learn to let Guadalupe speak to me. 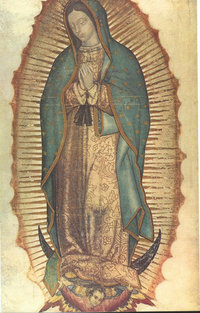 Culturally it seemed that I lived a world far from that of those for whom Guadalupe resonates. However, what Guadalupe represents most to us is the ability of our faith to transcend language and culture--Guadalupe is truly a catholic event. My relationship to Guadalupe grew gradually out of the Marian devotion I learned as a new Catholic coming through the RCIA many years ago. Having come from a Protestant background, I think that the Marian dimension of the faith might have been the hardest for me to accept, but perhaps the one thing that helped in that regard more than anything else was the rosary. Someone had the foresight to put a rosary in my hand. Certainly, I feel that God had invited me to explore the rosary and to examine how I might come to Jesus by way of the one who bore him. There was something irresistible in the prayers of the rosary. Someone, it seems, had been praying for my soul--my mercy-needful soul--for some time. My first experiences of Guadalupe were introduced to me by means of a culture where I live that has coexisted alongside the English speaking culture since the days when my Anglo-Saxon and Scottish ancestors first arrived in what was then a foreign land. Ironically we look to Our Lady of Guadalupe as the patroness of the Americas--rather than standing for a segment of us, she stands for everyone, especially in our ability to carry and receive the message of Christ. Guadalupe stands for our hope that the western hemisphere, and the whole world, ultimately will belong to Jesus. Naturally the first bearer of the message of universal salvation is the one who bore salvation for us. Guadalupe tells us that Christ has come for all people, especially for future generations and converts. Six years ago my mother, actually my great aunt but still the only person whom I had ever known as Mother, lay dying in a nursing home. I was just finishing up the last part of the diaconal formation process with ordination only a few months ahead. I was planning on making a trip to the far Northeast corner of the state to visit my mother. I felt her need as she struggled with the pain of her last days. Relatives had said, "How long will God let her suffer?" So, a week before my visit, at one of the parishes where we were having formation classes, I took a moment to pray. I found in the parish church a beautiful copy of Guadalupe and I knelt and prayed--"Assist me dear Mother, and assist that one who gave her love to me as a mother." A week later mother converted to Catholicism as she lay in a nursing home bed and I had the privilege of baptizing her. That afternoon she held my rosary--the same one I still use for prayer and carry in my pocket daily. Mother died peacefully only a couple months later. Throughout my faith journey icons have played an important role. Perhaps none has been so important as she who is surrounded by the light that is her Son while she mysteriously bears him at once. She always bears him--always she serves as carrier of the Good News, the Evangel within. In Guadalupe the mystery appears richer because in order to apprehend it we must suspend our cultural prejudices. We let go of who we are in order to hear her speak to us--she speaks neither in English nor Spanish. We hear her in the tongue of the New World, a tongue that leans toward heaven because it resembles the new and final world in which Christ is the eternal light. We too are the new people of God and when we are able to receive the message of Christ in a tongue that transcends our own, it is as profound as roses blooming in the snow. The Gospel truth: How the board of the Christian Coalition came to fear the basic teachings of Jesus. The coalition's incoming president, the Rev. Joel Hunter, pastor of a megachurch in Longwood, Fla., proposed that the group broaden its agenda beyond opposition to gay marriage and abortion. He proposed a campaign to, among other things, reduce poverty and prevent disease. Faced with this agenda in line with the clearest teachings of Christ, the board of the Christian Coalition told Hunter it would be better if he got lost. There are many things one could say in response, but this speaks best.